The Billion Oyster Project is a long-term, large-scale plan to restore one billion live oysters to New York Harbor over the next twenty years. 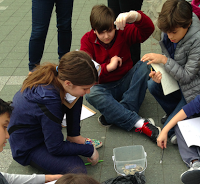 In an effort to help repopulate New York's oysters and enhance the once most biodiverse estuary in the world — New York Harbor — Yorkville East Middle School students are helping to create and place oyster gardens throughout New York Harbor. Students at Yorkville East Middle School take the role of restoration scientists, as they care and monitor our oyster garden and monitor the river water quality through multiple water quality tests. Through field trips to our oyster garden, students tend to our oysters and collect scientific data on water quality, oyster growth, and biodiversity, which is later shared with other research scientists around our area who are currently studying New York's oyster population.